Many of the fossils of the Late Cretaceous Lance Formation of Wyoming (about 65 million years old) are of freshwater organisms, such as this freshwater ray, Myledaphus bipartitus. 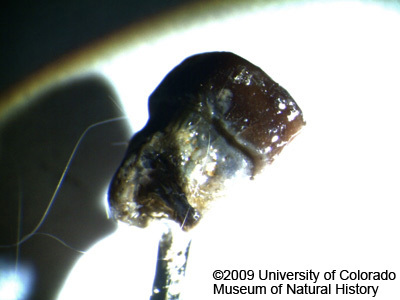 Ray teeth are common microfossils, easily recognized by their six-sided peglike shape. The teeth fit together like a honeycomb to form a broad, flat plate the ray used to crush its food. Living rays with similar teeth eat clams and other hard-shelled animals. Myledaphus was once thought to be a stingray, but since a complete skeleton was found in Canada, paleontologists now consider it to be a guitarfish, a type of ray whose extinct members looked much like stingless stingrays. The Lance Formation has produced many important fossils, ranging from tiny microfossils like those collected by harvester ants to fully articulated dinosaur skeletons. It was deposited by streams on a coastal plain stretching along the shallow interior sea of the Western Interior Seaway, which cut North America in half. Dinosaurs, reptiles, fish, amphibians, birds, and small mammals lived in a wet subtropical climate very different from today's dry seasonal climate. Find out more about Myledaphus from The Royal Tyrell Museum of Canada. See a video about engineer Graham Hawkes' deep-sea submersibles, which make it possible to observe giant marine rays: Graham Hawkes flies through the ocean. 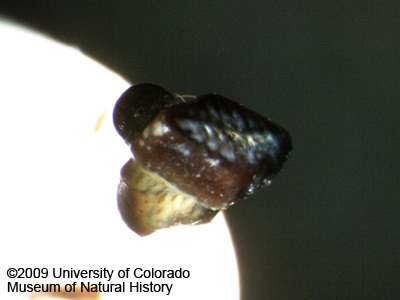 Learn more about the Lance Formation with Passport-In-Time Microvertebrate Fossil Project at the University of Wyoming Geological Museum: Late Cretaceous Paleontological Resources in the Public Eye.